Change Checker has launched the 50p “Scarcity Index”, which tracks which circulating 50p coins are the most scarce and collectable. There’s no surprise to find Kew Gardens at the top of the list. With a mintage of just 210,000, it is also the least owned and most requested swap. The next 4 scarcest coins are all from the 2012 Olympics – Football, Triathlon, Judo and Wrestling. Additionally, some designs are more hoarded than others by people who might not normally collect coins – the Beatrix Potter issues being a classic example. Finally, it can be up to a couple of years before the Royal Mint eventually confirms the actual mintage for an issue. The Scarcity Index does not necessarily equate to value but it is certainly an effective indicator. Whilst Kew Gardens 50p coins command prices on eBay of between £70 and £100, other coins towards the top of the scarcity index typically achieve a premium of roughly 10 – 12 times face value. But don’t forget the joy of Change Collecting is that you have always have a chance of finding any one of these coins in your change – even Kew Gardens – you just have to be sharp-eyed. What about £1 and £2 Coins? The £1 Scarcity Index has already been published for the round £1 coins and, because they are no longer being issued, this is now set in stone. Change Checker will be releasing the £2 Scarcity Index later in April. The Rio 2016 Olympic Games are in full swing and we can hardly believe it’s been 4 years since London 2012. 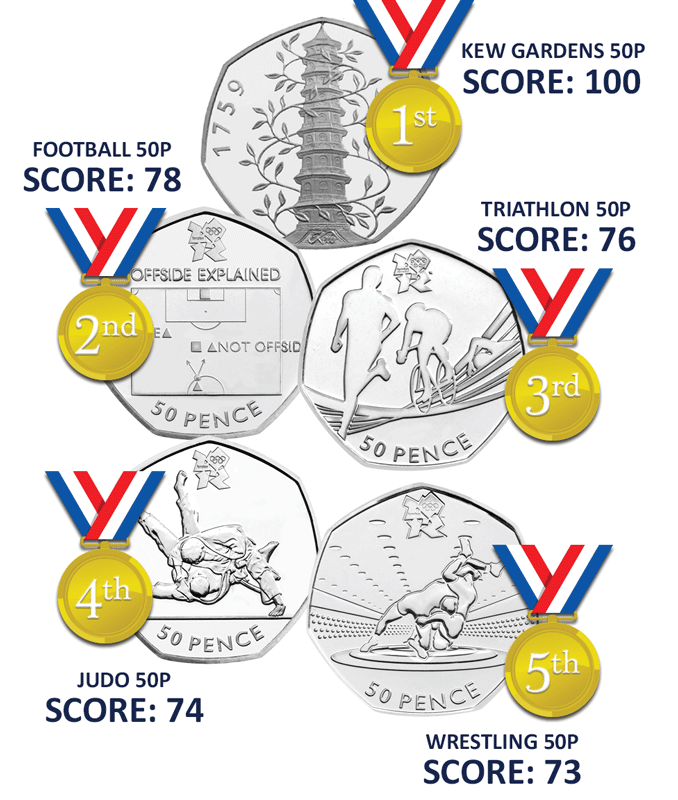 It’s about time we revisited the iconic UK Olympic Fifty Pence series. Without doubt, the 29 coin series created a storm among collectors – millions rose to the challenge of collecting all 29, and for many, it marked the start of their interest in coins. The Royal Mint estimates that as many as 75% of the Olympic 50p coins have been removed from circulation by collectors. Olympic 50ps have long been a favourite amongst collectors, but did you know that only 1,125,500 Football fifty pence pieces entered circulation? It’s definitely the rare one to look out for. Although you may recognise this coin, you may not know that a rare version of this coin exists. 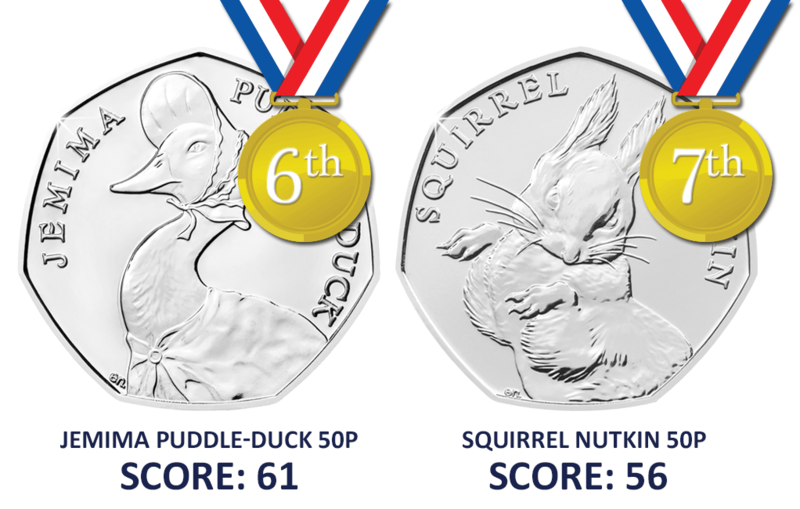 When the competition winner was revealed, only 100,000 special edition Blue Peter coin packs were released with a 2009 dated coin – making it the only Olympic 50p without a 2011 date. To the delight of many Olympic 50p collectors, this year the Royal Mint issued a special 50p to wish Team GB success for the Rio 2016 Games. The coins obverse features a swimmer with the Team GB logo, the Olympic rings and the inscription ‘TEAM GB’. Designed by Tim Sharp, the coin has been officially endorsed by Team GB and celebrates the spirit of British Olympians – a must have for all Olympic 50p Collectors. Click here to own the coin that will be popular with coin collectors and sports enthusiasts alike.